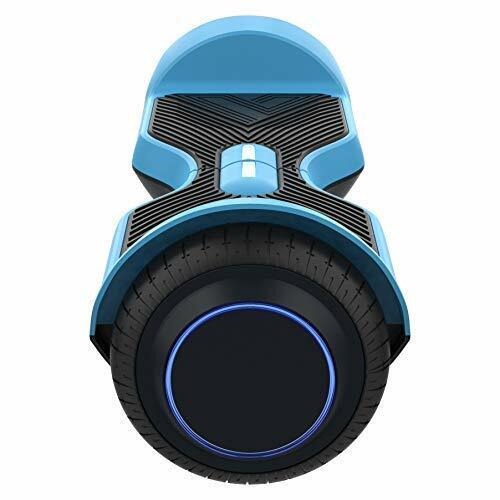 In the emerging world of personal transport technology, one only has to scan a few articles online to realize that the hoverboard is quickly gaining ground as a recreational favorite. Once thought of as only something you’d see in the movies, hoverboards are now becoming a crowd favorite, with many companies chomping at the bit to get your attention. One of those companies is America’s own GoTrax, housed in Dallas Texas. Their brand of hoverboards began to see the light of day in 2017, and have quickly risen to the ranks on Amazon’s Best Seller Lists. This rapid rise in popularity of their high performance hoverboards is the result of their diligence and devotion to ensuring that their designs are built around the user’s needs. One of their top sellers is the GoTrax SRX. With it’s self-balancing technology, the SRX is made to make your commutes quick and easy. Carefully engineered, tested and UL certified, this is the model you want to give your kids a secure, worry free ride. When it comes to crafting the best hoverboards on the market, you can trust GoTrax to be your “go-to” company, offering you the best in design and customer service. If you’re looking for some fun personal transport to help you navigate through town, or simply looking for a reliable and dependable weekend recreational ride, stay tuned because the GoTrax SRX may be just what you’ve been looking for. 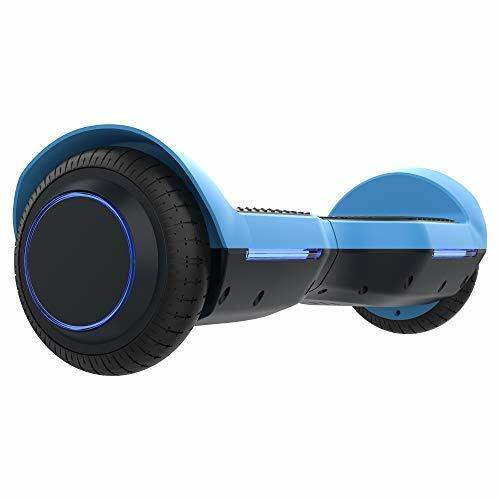 This UL 2272 certified, self-balancing hoverboard will propel you quickly and easily to your destination. GoTrax has gone to great lengths to provide you with a secure ride, through tough testing procedures to ensure that your SRX is both fireproof and explosion proof. As for terrain, the SRX is built specifically for standard urban terrain, such as level pavement, sidewalks and smooth ground. 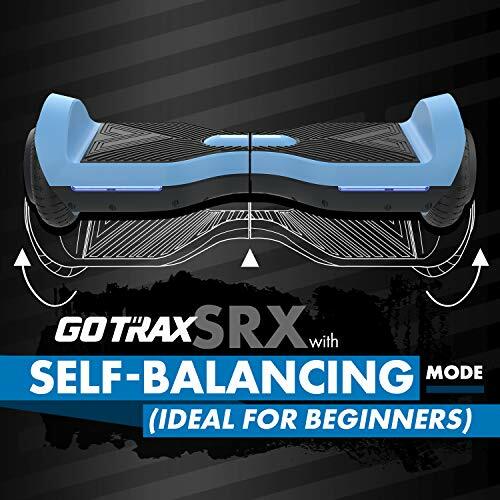 The GoTrax SRX comes with 6.5 inch, solid rubber tires and can reach a top speed of 7 miles per hour. It’s 200 Watt dual motors are powered by a 36 Volt battery and can transport you up to a 5 mile range, while supporting riders up to 220 pounds in weight. It also comes complete with Bluetooth and LED lighting. You get an LED light integrated in each wheel, and 2 in the front which act as headlights. 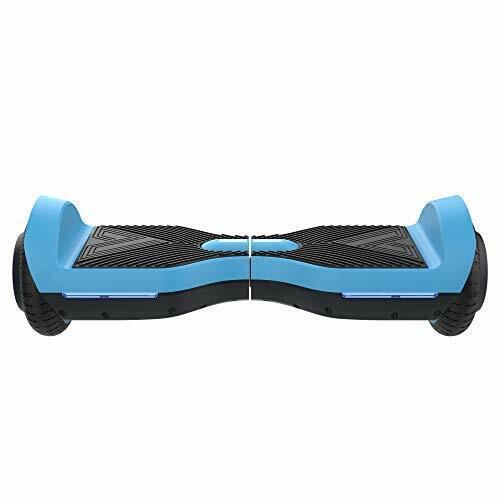 So already you can see how this could be the perfect hoverboard for both beginners and more advanced riders alike who are looking for an affordable, realiable urban ride. The SRX has something that previous GoTrax models the Hoverfly Ion and Eco were without: Bluetooth Technology. Here, an integrated Bluetooth speaker provides a convenient and easy way to enjoy your favorite tunes as you motor down the streets. Imagine yourself, moving to the rhythm of your best beats, and doing in GoTrax style, control and comfort. Portable and easy to carry, simply ride it to a friends house, plug it in, and in 3.5 hours it will be recharged and reach to take you back home again. While this hoverboard review centers around the GoTrax SRX, it’s important to also acknowledge it’s sibling when talking about the best hoverboards on the market today. This is because some of you might not be looking for an urban ride, but searching for a dependable and awesome all-terrain hoverboard, one that you can traverse in off-road mode. The SRX Pro comes with tough, sturdy and long-lasting 8.5 inch solid rubber all-terrain tires which can handle both the smooth, even terrain of urban environments as well as the dirt, mud, gravel and grass found in off-road environments. The SRX Pro model has an all-terrain top speed of 7.4 miles per hour, a 7.5 mile range, powered by 250 Watt dual motors, bright LED lights and UL 2272 certification. This hoverboard represents the best in precision engineering at an affordable price point, especially when you consider that most of its competitors cost around $400 a pop. Like the SRX, the SRX Pro comes with Bluetooth speaker technology, so you can enjoy a relaxing ride listening to your favorite tunes. Before we let you go, remember, that no matter what hoverboard you settle on, don’t forget the gear. While you may be thinking you don’t need it, because you aren’t going to go cruising down the highway, there are still incidents which can occur. These can include smacking into a bump, making a bad turn, or having a confrontation with a stray dog or pedestrian. So, it’s a good idea to consider purchasing a helmet, such as the Protec Original, and some protective gear like JBM’s protective pad set . There are also some accessories to consider for your GoTrax SRX. For instance, it’s not a bad idea to invest in a hoverboard transport bag, which can make it much easier to tote when you can’t use it in tight, public spaces. Keep your GoTrax SRX secure by getting a hoverboard combination lock. Finally, to make that hoverboard truly your own, consider purchasing a cool, stylish and attention getting hoverboard skin. 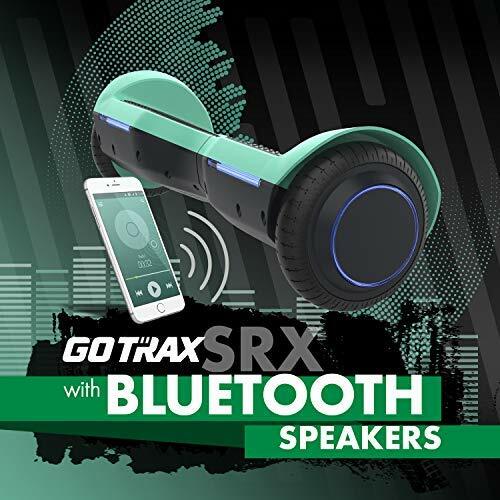 Finally, if you have kids, think of turning your GoTrax SRX into a go cart with this simple, inexpensive accessory by KKA which turns most hoverboards into a go cart instantly!